How's your Gaelic? 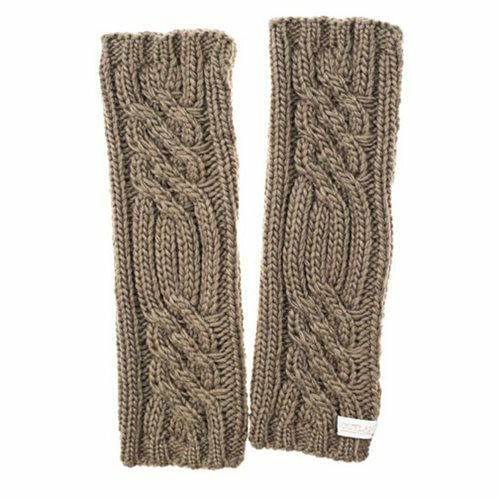 You may have to brush up to correctly pronounce the name of these Outlander Mo Nighean Donn Arm Warmers. Mo Nighean Donn means "My brown-haired lass," which Jamie Fraser affectionately calls his wife Claire in the Outlander TV series. But dinna fash ("no worries")! You don't have to be a brunette to wear these neutral-tinted knitted goods. No matter what color hair you have, you'll stay warm while travelling 200 years into the past. The warmers measure about 12 1/2-inches long x 3-inches wide.